1989 to 1990 was quite a dropoff in quality for the NWA, and the Great American Bash PPV falls right in line with that. The long-awaited Ric Flair vs. Sting showdown had been in the works for months, and was originally booked for WrestleWar that February. But a knee injury sidelined Sting for four months and Lex Luger took his spot, turning babyface and feuding with Flair until Sting was ready. While this was certainly a huge marquee match, I wasn't a Sting fan at the time and therefore wasn't particularly excited about his inevitable Title win. I was also pissed that the company reverted just about all the top stars to where they were in 1988. Flair and the Horsemen were the top heels, Luger was a babyface again. It all felt like a retread. As for this show, once again they crammed way too many matches in, and this time it was an astonishing eleven bouts, nearly half of which had no business on a PPV. First up was Brian Pillman vs. Buddy Landell. This was a decent enough opener, as Pillman was obviously quite accomplished and Landell was a solid hand. I'm not sure what the purpose was though. They weren't feuding and Pillman had come off of a really strong US Title program with Lex Luger, followed by a US Tag Title run. Why was he being wasted in a throwaway showcase match? Next was Mike Rotunda vs. The Iron Sheik. Seeing mid-80s WWF guys like Sheik, Orndorff, Bob Orton, and Junkyard Dog show up in the NWA in 1990 was so strange. I guess they just wanted recognizable names to help put over the younger NWA stars at this point. Rotunda had given up his Varsity Club gimmick in favor of a sailor persona, which was beyond stupid. Rotunda didn't have babyface charisma at all and the Captain Mike thing reeked of 80s jobber. Mike won a brief match that was out of my head the moment it ended. The third consecutive throwaway match on this show, Dutch Mantell vs. Doug Furnas was designed to showcase newcomer Furnas, but the match went on far longer than it needed to, and again, I'm not sure why this was included on a PPV. Furnas won with an impressive belly-to-belly suplex after eleven ponderous minutes. The oddly pleasant surprise of the night was Harley Race vs. Tommy Rich, in an incredibly physical match given Race's age (He was 47 but looked 60), that proved Race could still turn it up when he needed to. Contrary to expectations, Race did most of the crazy bumping, including his usual back somersault over the ropes ending with his head hitting the ring apron. This match had historical value since nine years earlier Rich upset Race for the NWA Title, but otherwise this was a superfluous match that was better than it had any right to be. How'd Eaton not suffer massive spinal compression? The proper PPV began with the Midnight Express vs. Southern Boys, another classic effort by Eaton and Lane. In the tradition of MX's battles against The Rock n' Roll Express and The Fantastics, this match began with babyface team dominance as The Southern Boys stayed one step ahead of the Champs for the better part of ten minutes. Eaton and Lane eventually took control after some heel tactics, and the match built to a melee with multiple finishers before Eaton rolled up Tracy Smothers in a small package for the win. The Midnights were in peak form in 1990 and this was one of the highlights of their year. Back to the squashes, we next got Big Van Vader vs. Tom Zenk. Vader was awesome but why was this on a PPV? Former Tag Champs The Steiners next faced The Fabulous Freebirds in a kinda disappointing effort. Hayes & Garvin were dressed in sequined pants and suspenders, and wore makeup for some reason. The Steiners looked great as usual, but I was never impressed by Hayes or Garvin. Rick & Scott dominated most of the match and after Scott nailed the Frankensteiner on Hayes, Garvin hit him with a DDT and went for a pin. But Garvin wasn't the legal man, and while the referee kicked him out of the ring, Rick hit Hayes with an overhead suplex and Scott pinned him. It was now Saturday Night's Main Event time, as Arn Anderson, Barry Windham and Sid Vicious took on Paul Orndorff, The Junkyard Dog and El Gigante (or The Dudes with Attitude - a terrible name for a stable that the WWF ripped off five years later) in a mediocre, kinda sloppy, WWF-style six-man. El Gigante spent literally the whole match on the outside except for one run-in. This was effectively a handicap match that ended with Sid throwing Ornorff over the top rope for a DQ. Only then did Gigante get physically involved, chasing off the heels. Pretty bad stuff. The US Title match saw Lex Luger defend against "Mean" Mark Callous. This wasn't the most thrilling match but it was fun to see Luger vs. The Undertaker, a match the WWF confoundingly left on the table during the three years Luger worked for them. Callous was already using a couple of his future character's trademark moves, such as the "old school" and the throat thrust. By the way, is there a more generic-sounding moniker than "Mean" Mark? Sounds like a low-echelon boss character in a videogame. At the end of the match Luger picked Callous up for the Torture Rack - an impressive feat - which led to Callous accidentally kicking the ref. Paul E. Dangerously then hit Luger with his cellphone and Callous went for the pin. But Luger kicked out and leveled him with a running clothesline for the win. This was alright. Why you so mean, Mark? The semi-main event pitted Tag Champions Doom vs. The Rock n' Roll Express, in a pretty generic RNR vs. Big Team match. Nothing terribly memorable about this one, and I always found Doom's offense pretty nondescript. Ricky Morton played the face in peril as usual before making the hot tag. All four guys wound up in the ring at once until Reed hit a flying tackle off the top rope on Gibson for the win. The crowd was pretty dead for this, surprisingly. Flair looks like one of the Glamor Girls here. Finally we arrived at the main event designed to pass the torch to the franchise player of the 90s, Sting. Considering the match was six months in the making, this was pretty anticlimactic. There wasn't much urgency until about the last five minutes, and it only got sixteen total. And strangely Flair and Sting didn't wrestle the first two thirds as though they only had sixteen minutes to work with. I guess realistically they wouldn't have known this was going short, but I would think the brief running time would be a byproduct of the pace being set, no? Also I found the psychology of the match stips sorta backwards. The Horsemen were banned from ringside and Ole Anderson was handcuffed to El Gigante, plus Sting's friends were all stationed around the ring. This sorta created the opposite dynamic of what you want in a babyface title change - Sting seemed almost guaranteed to win here, so the suspense was missing. Toward the end the Horsemen attempted to run in but were blocked by the Dudes, and Flair went for a Figure Four but Sting rolled him up for the pin. Precisely the same finish as when Steamboat beat Flair for the belt at Chi-Town Rumble, and again when Sting beat Flair at Starrcade. Christ Ric, I love ya but come up with a new ending! This match was fine but nowhere near what it should've been given the long build. 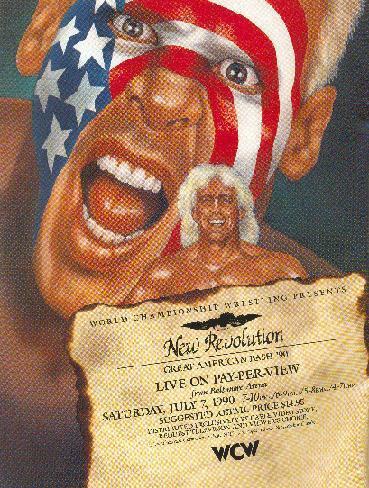 By contrast, Flair's WrestleWar match against last-minute replacement Lex Luger went 39 minutes. "I can't believe how easy that was!!" The 1990 Bash took place at a time when the NWA's creative was driving off a cliff. They'd set up the top of the card as an overly safe 1988 retread while also overloading their PPV events with filler. Sting's coronation was a nice moment and a new top star was long overdue, but the execution felt phoned in and messy. Sting's first Title reign would be hobbled by the insipid Black Scorpion angle, which ended up just being an elaborate prank by Ric Flair anyway. It was around this time that I tuned out of the NWA/WCW product, and I never really got back on. What I'd Change: Dump the first four matches, none of which had any business on a PPV. Give the main event the 25 or so minutes it deserved and change the stip so no one was allowed at ringside. Maybe put all the Horsemen in a cage with Sting's pals standing guard in the aisle.